Warning: there are a fair amount of horrible puns (I’m not even sure we can call them puns) in the next two paragraphs. You may want to look away. I’m a huge Blackhawks fan. I don’t know how many of you have been following the NHL Stanley Cup Finals, but spoiler alert, the Blackhawks are in them. It’s 2-1 and the Blackhawks are down one game, with a home game tonight at the United Center. I was at the game on Monday with my sister, Amy, for a disappointing loss, so I was feeling like I needed to bring some good luck to the boys. I do that the only way I know how: baking cookies—Chicago Blackhawks Sugar Cookies to be exact. Am I the only one that feels like baking sugar cookies in a specific shape and then decorating them will somehow bring good luck? Yeah? If you all think I’m a hoser, you’re probably right. But I like this idea, and I’m sticking with it! I probably should have made a Bickell or Sharp cookie, because they could use the luck if you know what I’m sayin’. I will admit that a Marian Hossa cookie did get injured in the making of these cookies, but I’m calling it a healthy scratch since it still tasted so good! This was surprisingly my first complete attempt at a Blackhawks cookie. I’ve tried in the past to make the logo and while close, never actually finished the design. So this time I started off a bit simpler with just the backs of their sweaters. I started the longer names first, which probably wasn’t my best idea since I hadn’t figured out the spacing too well yet. If you’re doing a Hjalmarsson or Teräväinen cookie, you may want to keep that in mind before icing the cookie. No one likes an icing call. If you want to decorate these power play of a cookie, follow my pictogram below! These cookies are sure to hook your friends and family! 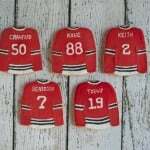 These Chicago Blackhawks sugar cookies are a fun way to show your hockey pride! They're gluten-free, too! To decorate the cookie, I used a picture printed from the internet and cut around the picture. You can also use a hockey jersey cutter if found. Outline the cookie using red icing (10 second icing), leaving a space at the bottom to outline in white. Outline bottom part of jersey with white icing (10 second icing). Add black and white strips (10 second icing) to sleeves, collar, and bottom of jersey. Allow to dry. Flood jersey with red icing (4 second icing). Allow to dry completely. Using 10 second white icing in pastry bags fitted with a number 2 tip, add jersey numbers to the cookie. Using 10 second white icing in pastry bags fitted with a number 1 tip, add last names above the numbers. You can use 2 1/2 cups of all purpose flour instead of the gluten-free flour blend. Follow my pictogram below to decorate the cookie! Making these & drinking! She told me her an Aunt Jan were at Patti’s! I know she came home yesterday so there’s still time! I also told her I want some of Grandma Theresa’s recipes!